I was going to do a first look review type of post on the Alpkit Rig 7 but @petesy in the Spring issue of Trail Magazine beat me to it. It took both the Best in Test and the Best Value award. Scoring 4.2 out of five, you don't need me to tell you how good it is. I thought I would be better writing a bit about how I use it. Especially as a few people were asking. Better that than going over old ground as it were. 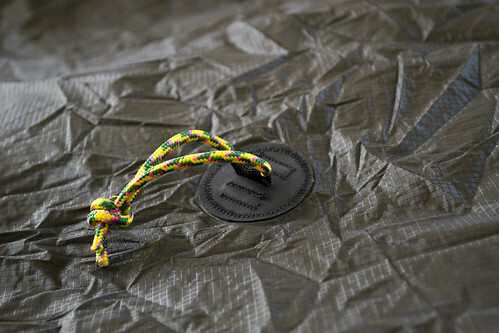 It's not the lightest tarp by a long shot but it is very versatile. The one that I recieved weighed in at 497 grams on my scales, naked. The Rig 7 does pack down nice and small, the stuff sack is a little tight and weighs 34 grams. 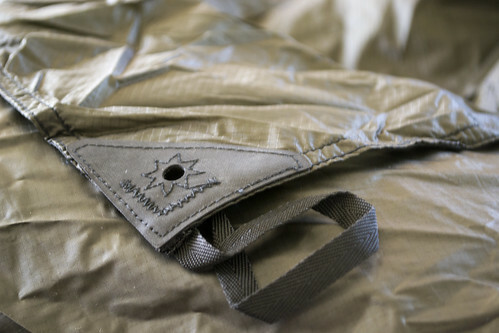 The material is 30D siliconised nylon measuring 280 x 240 centimetres and 18 x 14 centimetres when in it's in the stuff bag. It has 16 reinforced rigging points that run along the outer edge. It also has 8 reinforced lifter rigging points arranged across the body of the trap. These are what makes this trap versatile. It allows for near endless adjustments to pitching and the configurations are only really limited by your imagination. 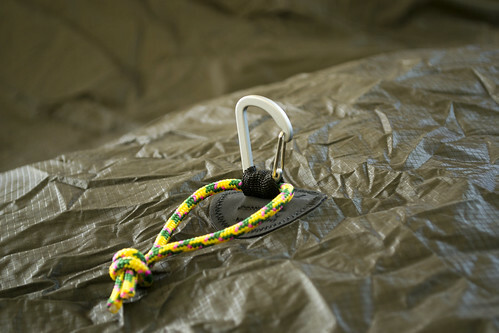 They also help to make the tarp very secure in the wind as you can tie it down further. After a couple of uses, I made what I thought was a useful change. I tied loops of 4mm cord to all the lifter points. This made it much easier to attach pegs or guylines. No more fiddly threading through the lifter's eyelets in strong winds or the rain. On the downside it did make the stuff bag even more tighter than it was and the tarp a little bit heavier. It now weighs in with all the loops added at 554 grams. My current set up will probably have the Lightweights out there breaking into a cold sweat. What I carry with the Rig 7, is a lot, I suppose and weighs a bit but I'm willing to do that to keep my pitching options open. I have a 4mm cord of about 15 metres this is what I call the ridge line. I then have 6 guylines with lineloks of 3mm cord, 2 of which are 2 metres in length and 4 which are shorter, measuring in at 120 centimetres long. These lines weigh 10 grams including the lineloks. With that I was carrying 8 aluminium pegs. I also have 6 stakes but I only carry them if there is a chance the ground is going to be soft. 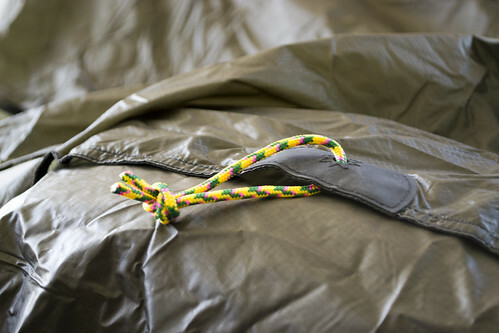 We all know that a tarp has the potential to catch the wind become a sail. I also found that carrying some 3mm clips; I carry 5 in total, each being 3 grams was also very useful. It allowed me to run a ridge line between two points and then quickly clip the Rig 7 to the line and then either peg out or use the guylines to strap it down. A more efficient way of doing things. 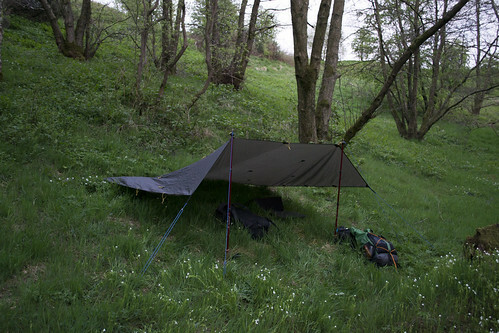 Walking with poles has also increased the versatility of tarping, my options have now increased again to a point where I'm not sure I would use a tent. It now seems so limiting. 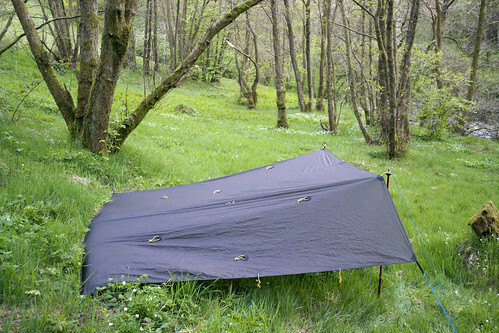 However I will have to get my sleeping set up sorted if I want to use the Rig 7 in the winter. A lot of this has evolved from a my own experience and what I've seen around the internet; on different blogs, youtube, talking to others on twitter and good old out there and learning from your mistakes. As I can point out from the last outing on the River Ayr Way with Phil, @MrPhilTurner. I discovered that I wasn't carrying enough pegs. I had enough for the configuration I was using when on my own but this time, with the two of us under the trap I was a peg short. It wasn't a major issue I could have removed one from along the back but Phil saved the day with his super poo peg. It is always evolving and changing so I dare say that if you ask me in a few months time, it will have changed. Again. There are some things that will change soon. I could make and can make things lighter for myself (when I have the spare cash). I'm looking at getting a set of titanium pegs. I could also change to dyneema for my guylines as I could reduce the thickness down to 1.5mm without comprising the strength. Not sure I would want to go too thin on the ridge line for fear of slicing through the fabric if I was to lay the tarp over it. Overall it would lighten the load by a good a few grams. Ounces like pennies, save pounds. 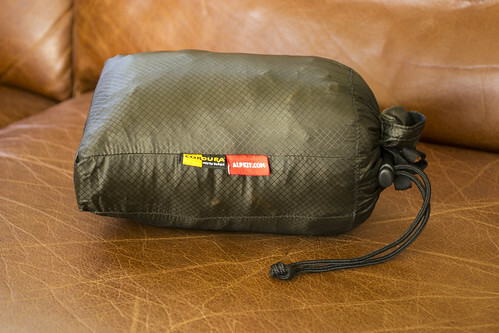 I also think a slightly bigger stuff bag would be a good idea possibly even a dry sack so that I can a put a wet tarp straight into the rucksack and not worry about anything else getting soaked. Another step to take in the journey to lightening the load. All in all it is a great bit of kit and I thoroughly enjoy using it. It has made sleeping in the great outdoors fun again. No longer closing myself away at night, I am now apart of what is going around me. No more wondering what the noises are out side of the tent, usually it's still light enough for you to see. You'll be amazed how bright the world is at night under the sky. Try it.